I work in the financial services industry. I’m fortunate enough to work for a company that’s forward thinking, yet the financial industry as a whole is tough place to be if you’re trying leading edge digital marketing. Not only is it (by nature) risk averse, the financial industry is also heavily regulated. Every marketing word and action has to comply with internal and external regulations. It takes tenacity to succeed (or as one of my brilliant colleagues likes to say, “Consistent Persistence”). If you’re in charge of the digital direction of the firm, nobody is going to point you in the right direction to make the next leap for the firm. In a risk-averse culture, I’m the one constantly sticking my neck out, recommending a possible new solution to a problem that hasn’t even hit the radar. Achievers in traditional organizations often say, “I want more authority.” They mean that they want the power to make things happen, the mantle of authority that will allow them to get things done. This is an industrial-era mindset. Management by authority is top-down, risk-averse, measurable and perfect for the org chart. It’s essential in organizations that are stable, asset-based and adverse to risk. Ah, your bluff is called. Asking for responsibility (or better yet, taking it) is very difficult. If it succeeds, there will be a team of people that helped you make it happen. If it fails (and it will sometimes), you have to *gulp* and take the hit for it, knowing you tried and learned something from it. Congratulations! You’ve been hired or promoted to take charge of your company’s online strategy and execution! At some point, the elation will fade and you’ll confront the same question everyone faces when they’ve been put in charge… “Where do I begin?” There are many different places you can start, and many would be correct. But if you are stuck in indecision, maybe this can be a path to get you moving. First things first, and this has nothing to do with digital strategy. I suggest you read “The First 90 Days” by Dr. Michael Watkins. It is an amazing guide to getting up to speed in a new organization, helping you survive the transition and come out at the other end with solid momentum and a strong reputation. First, get the analytics. Very soon into your first week (and ideally, your first day), open a corporate account at Google Analytics. Throw the analytics code into the bottom of every page (ideally in a common element of all sites like a footer). As well, get an account at Google Webmaster Tools, put the confirmation file on your root and start collecting the data. If you don’t know how to do the above, your IT group should be able to help you. Don’t worry about the data for at least a month. Let it collect. While you’re waiting for that month of data to accumulate, you need to understand how to interpret the data you’ll be collecting. To do that, you must read one book. “Web Analytics 2.0” by Avinash Kaushik. I’ve been looking at Google Analytics stats for years and thought I understood what the numbers meant. After reading Avinash’s book, I realized that I had no idea what I was looking at. It changed my entire outlook on analytics. Based on your data and the remarks from your stakeholders, you probably have a sense of some low hanging fruit or things you can execute and launch quickly to build momentum. Momentum is often overlooked. Early wins help everyone see that ‘something’ is happening and it’s not going to be all talk and analysis. It also helps spark conversations. As the old saying goes, “It’s far easier to critique than create,” so give the stakeholders something small to critique. It provides low-risk feedback and helps hone your longer term strategy with minimal effort. This advice will probably get you through the first week. In Part 2, we look a little longer term and talk about how to get an assessment of your team, understand your corporate culture and how to define your own measures of success. Allow me to highlight a few of these that changed the way I think when I’m working. 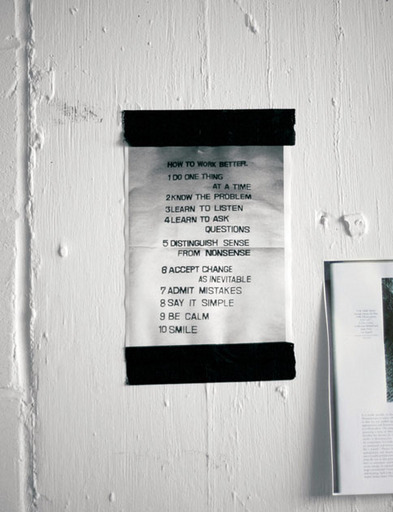 The first one… ‘Do one thing at a time’ is a very important one. I don’t believe that human beings are capable of multi-tasking. There is a huge reduction in returns when you try to do more than one important thing at a time. I’ve tried. When I try to do two things, neither one is even 50% as good as if I had focused on it completely. Prioritize, concentrate on the most important item and either complete it, or leave it at a logical point where you can pick it up again. The next important one is ‘know the problem.’ I deal with it quite often. The first thing you think about is the problem. Usually, you’re wrong. There is an old saying that you have to ask ‘Why’ 3 or 4 times before you get to the heart of the problem, or the Root Cause. Until you know the problem, it will be difficult to work on the solution. 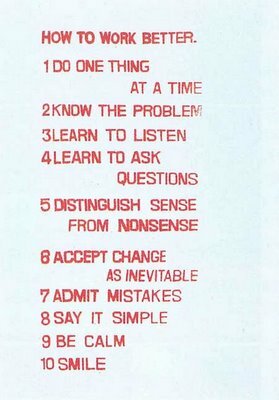 ‘Learn to listen’ and ‘Learn to ask questions’ are related. Learning to listen means more than just keeping your mouth shut. It also means more than just sitting there silently waiting for your turn to speak. I relate it more to Stephen Covey’s line of “First seek to understand, then seek to be understood.” Your questions should clarify the other point, not subtly drive the person to your view point. ‘Say it simple’ relates directly to an article I posted earlier about being able to explain it to a 6-year-old. Who’s going to do what by when? It doesn’t get any simpler than this. And this is what project management on a digital project is all about. It’s simply defining the task list of what has to get done in chronological order, getting a name beside each task, and setting a realistic deadline to each item. Of course, this doesn’t apply to a typical PMO in a large organization. The PMO “process” has many other steps, reports, meetings, documents, etc., that have to be filled out in triplicate to push a project along. But those steps (in my experience) are not there to help a project get completed. They are there to protect management from being called to task for a project that failed. Piles of paper can be pointed to that prove that, even though the project failed, the process succeeded! If you actually listen to the podcast, they make mention of the picture of a pipe. It’s a metaphor that speaks loudly to the mistake many project managers make. Many PMs point to the BRD, TechSpecs, MSProject Plan, QA Plan, Go / No Go criteria and call it the project. As Mark Horstman so beautifully states, those are *not* the project! Those are representations of the project. The project is what the hands on the keyboards are working on, not the reports. The picture of the pipe says it all. 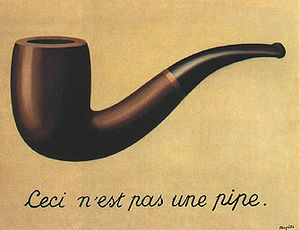 If you’re not literate in French, the text essentially reads, “This is not a pipe.” Meaning, of course, that it is *not* a pipe, it is a representation of a pipe! Your project plan is a representation of your project. It is *not* your project. Your plan shows “Who’s going to do what by when.” The Who, What and When are your project. One rule I trust is that if you can’t explain your concept, idea, technology to your own mother in a way that she’d understand it, you are either don’t understand it yourself or you’re bluffing (and I don’t mean BLUF‘ing). I’ve seen this at both end of the spectrums. The “Strategist” talking about trending, friction, positioning, audience interactions, etc. but never getting down to a basic strategy that is simple and graspable. On the other side, the technology guru that talks about CMS, CRM, PHP, SQL, etc., but can never explain whether or how it will work in any human readable form. The search engine on your site can provide some meaningful brand insights, if you look at the stats in the right way. But dig a little deeper and some interesting data appears. For example, pull a report on which search terms were entered that returned exactly ZERO results. What does this tell you? It means that someone typed in the URL for your brand. In their mind, your brand = what they were looking for. And your search engine told them to go elsewhere. There is some incredible insight there! What if you looked at all the “Zero” returns and provided a page or a redirect that gave the user what they wanted from your brand? A real-life example of this is in one of my previous lives at a financial company. When we examined the search engine logs, we found several users had typed in the search term “Wrap Products.” (For those that don’t know the Canadian Mutual Fund industry, a wrap product is a specific type of mutual fund that consists of other mutual funds). A 0.1% tweak to our search engine, an 110% improvement in user experience and the user’s perception of our brand. In 2003, I studied for, took my exam for, and received my Project Management Professional designation (PMP). Since then, I’ve come across several people with their PMP, some even in Project Management positions! I’ve been asked several times whether getting a PMP is worth the time, effort, and yes, money. I’m of two minds on this. There is no doubt that having those three letters after my name on my resume have pushed me into the interview pile. Many job postings require a PMP. If I had to guess, the main reason would be to have another point of exclusion amongst the pile of candidates. Some of the theoretical knowledge gained from studying for the PMP has been useful. I can talk the lingo, understand a project plan (and often, see the faulty assumptions faster), understand the risks and can work with the PMs with the same language. It’s provides some credibility with Senior Executives when explaining why you can’t have nine women create a baby in a month. Unfortuantely, the PMP is geared towards big IT or Engineering solutions (at least is was in 2003). It doesn’t scale down well. In the world of digital, spending weeks on the Project Charter and more weeks on the Requirements means that someone else is going to eat your lunch. Much of it is not applicable to the iterative processes like Agile / Scrum, that are more prevalent in digital agencies. A die-hard PMP project manager would have a heart-attack when asked to start building before the second requirement comes in the door. In my experience hiring and working with Project Managers, the true test of whether someone will cut it as a PM on digital projects is “Notches on the Belt.” How many projects has the PM actually taken from a gleam in the eye to live? That is the true test for any PM in an interview. I’d rather hire a PM that’s launched sites, but does not have a PMP, than any professional Project Manager with a PMP that has taken very few projects to the end (no matter how big). So… bottom line at the bottom (ignoring my earlier advice). Is a PMP useful? It can be in certain scenarios. If you are looking for a new job, and you can get the cost of a PMP covered, and you have already taken projects end-to-end to back your PMP, I think it’s worth it. Otherwise, the theoretical knowledge received from the PMP will come back to bite you when the reality of a digital project gets in the way of your beautiful WBS. Being a people manager, I receive many emails from my team and from others regarding an issue or a situation with which they require my assistance. Quite often, I have to read an entire story before I get to the question or issue at hand. I’m a big fan of Mark Horstman and Michael Auzenne from Manager Tools. Although the concept of BLUF (Bottom Line Up Front) is not theirs, they discuss it in their (very excellent) podcasts quite often. I’ve gotten to the point where I insist that any member of my team sending me an email must state in the first sentence or two what the point of the email is about. I’m also brutal in my own email editing to ensure that the first two sentences tell the main story. If someone chose to stop reading there, my point would still be clear. Three months ago, Project X was started with an estimated completion date of Oct 31. Shortly after starting, the project team discovered that there was a discrepancy between the requirements as documented and the actual needs of our users. Also, the hardware available to complete the project was discovered to be inferior. Thankfully, I usually let important emails as this sit in draft while I moved on to the “Next Big Thing” for a while. I’m a big fan of David Silverman’s advice on how to edit an email. In re-reading this, I realised that the reader would have to read quite far down to understand whether I was raising a flag, asking for help, or patting myself on the back for a job well done in averting disaster. Project X is tracking to be approximately 6 weeks beyond the expected date of Oct 31, with an expected budget overage of $x. We are currently projecting a Dec. 15 live date. This is mainly due to discrepancies in requirements and an unforeseen hardware issue. From here, the rest of the email outlined the pertinent details of how we got here, what the impact is and what mitigation has happened to ensure confidence in the new date. When communicating professionally to anyone, via email, voice or in person, giving the bottom line up front sets the landscape immediately so that the other person doesn’t have to guess where you’re going and reorganize everything you have said up to the point of the grand reveal.